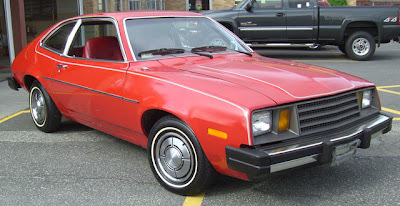 Just A Car Geek: Revisiting the Ford Pinto - The Worst Car Ever? Maybe. The Worst Case of Corporate Greed Ever? Definitely. Revisiting the Ford Pinto - The Worst Car Ever? Maybe. The Worst Case of Corporate Greed Ever? Definitely. As the US economy crumbles we're hearing more and more about corporate abuses and greed. Pyramid schemes, gigantic salaries, lavish parties, false accounting... All stuff done to satisfy the needs of greedy executives and to falsely fatten the corporate bottom line. All stuff done at the expense of the average citizen. Nothing, though, will ever compare to the Ford Motor Company and the Ford Pinto. This was corporate greed that was not paid for in dollars, it was paid for in lives. The Pinto's basic design wasn't incredibly bad, it was pretty much a standard issue 1970s US small car - unibody construction, a longitudinally-mounted engine in front driving the rear wheels through either a manual or automatic transmission and live axle rear end. The suspension was by unequal length A-arms with coil springs at the front and the live axle rear was suspended on leaf springs - it was the placement of the gas tank that caused problems. In a rear end collision, at speeds as low as 30 MPH, there was a chance of the gas tank exploding. To make matters worse, the car would often crumple in a way that made it impossible to open the doors, leaving the occupants helpless. Eventually, lawsuits and bad publicity (to say the least) forced Ford's hand and by the time this 1980 Pinto was built Ford had made changes to the car's design (and recalled the earlier cars). This Pinto is as safe as any other US small car from that era. The Pinto shown above is for sale. I'm featuring it as a curiosity. It's a bare bones 23,000 mile Pinto. No radio, no A/C, its only option appears to be the automatic transmission. Today, even the cheapest of the cheap small cars sold in America come better equipped. The auto industry has come a long way in the past couple of decades in terms of safety and standard equipment. Located in Springfield, MA, click here to see the Craigslist listing. This Pinto appears to be in decent shape and is not very expensive. Click here to find a good, concise article from engineering.com about the Pinto's design flaws and the corporate mentality at Ford during this time. Here is the really sad & tragic part: Ford already HAD a very good small car called the Cortina! They did not have to make the Pinto at all. The Pinto had incredibly poor use of interior space with the stupid "Slashback" styling that rear seat passengers were limited to small children or medium sized pets. Who were being punished. The Cortina looked like a 2/3 scale Falcon and was built by Ford of England. It even had such "advances" for 1970 as MacPherson Strut suspension and a cross-flow head. The 1.6 liter motor was the basis for the Formula Ford class of open-wheeled race cars like the Lotus 33.And, in my opinion, the "best" motor the Pinto ever got was the 2.0 liter four made in Germany and also put in the Capri. Sorry, Lotus 51 was the open-wheeled racer witht he Cortina block. My bad.